Technimark’s Gary Schiller Receives RJG Training Excellence Award. Technimark’s Gary Schiller was recently named as winner of RJG’s Training Excellence Award, a special honor that recognizes commitment to the RJG Master MolderSM Certification program. He was one of only three to receive the award. 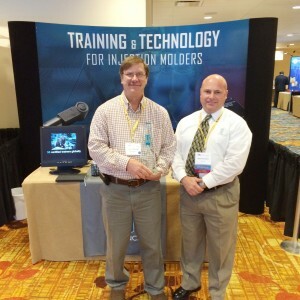 Gary Schiller is our Master Molder III “Train the Trainer” where he provides our in-house training. Technimark currently has 6 people certified as Master Molder II, 10 people certified as Master Molder I, and we have trained 54 people in Systematic Molding. Gary will have trained 100 people in the company by the end of the first quarter of next year. RJG Master Molding training has helped Technimark as a company to commit and dedicate training on systematic molding and standardizing processing methodology on a global scale. Gary received the RJG Training Excellence Award at the MAPP Benchmarking and Best Practices Conference in Indianapolis for his great work and dedication to injection molding. RJG, an acknowledged international leader in injection molding training, technology and resources, developed the Master Molder program to bridge the gap between classroom instruction and implementation on the production floor. The award was presented in October at the MAPP (Manufacturers Association For Plastics Processors) Benchmarking Conference in Indianapolis. ← Technimark to Double China Capacity, Add Cleanroom.